I did a lot of scrapping in June, but then July came and the boys baseball practice and tournament schedule took over our lives. I haven't been scrapping as much for July, but I realized I also hadn't been sharing much either. Before this month gets away from me, I want to share some of my favorite layouts from last month. 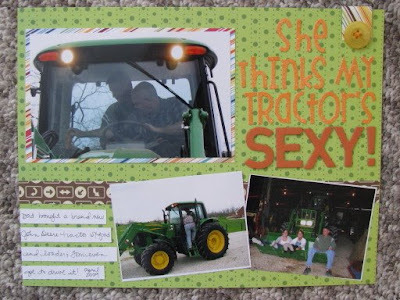 "Covington" was inspired by an Allison Davis layout. I love her work! 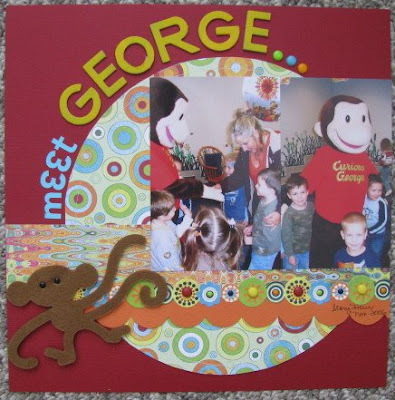 I found a great use for a felt Fancy Pants monkey on "meet George..."! I'd been saving this "the flirt" tag from a pair of Old Navy jeans for a while. I loved how it matched these My Minds Eye papers. These photos of Kevin playing with our neighbor cracked me up. 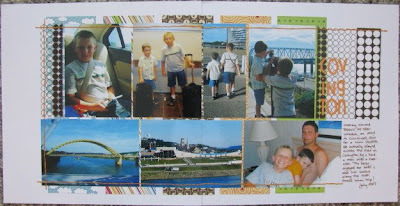 I loved the energy of the photos and paired them up with Basic Grey's Lime Rickey papers. 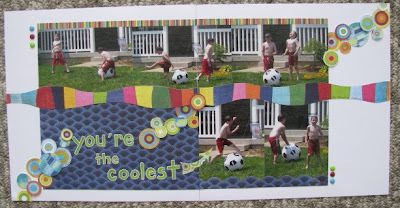 I thought the "movement" of the circles I cut out of the paper worked well with movement in the photos. One of my FAVORITE pages from this summer is "the Wind Up" for Blake. I handcut several stars from the MME paper and then raised them up with pop dots. I even pulled some old MM washers out of my stash to add as accents in the upper left corner. 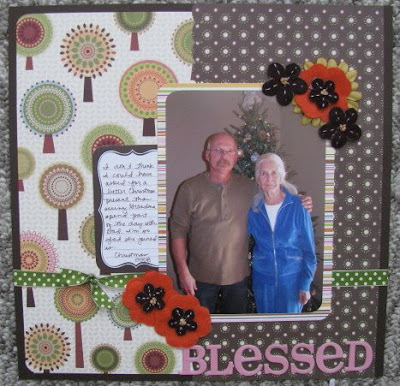 I love this photo of my dad and grandmother, so this page is a favorite of mine. I was able to use flowers! I got overly creative and girly for this page. 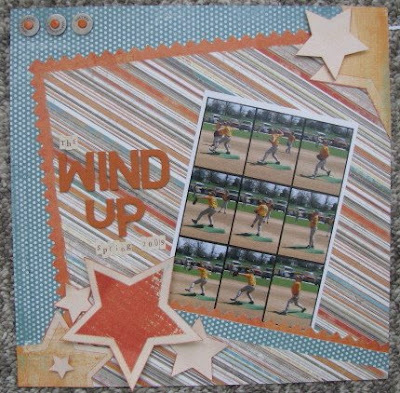 I used Versa Mark and stamped a background on the cardstock. (I rarely use stamps!) This page documents my first time in print. 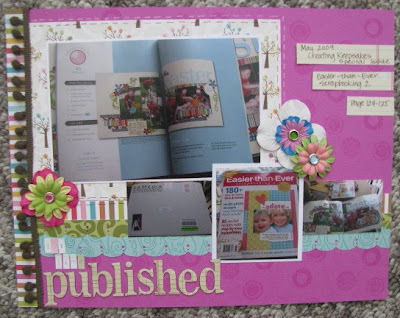 I was excited to be published in Creating Keepsakes Easier Than Ever Scrapbooking 2 back in May. Here is a simple, but meaningful page. I don't usually do "themey" pages, but the K&Co. Cub Scout line is a must for all the Cub Scout photos I have piling up. 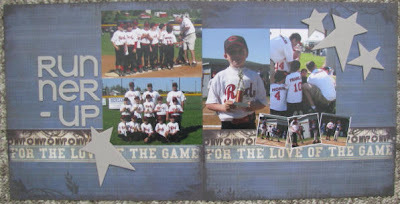 We were really proud of our boys accomplishments this year. As for themey...sports papers are the exception - I LOVE them. LOVED the WRMK MVP line. 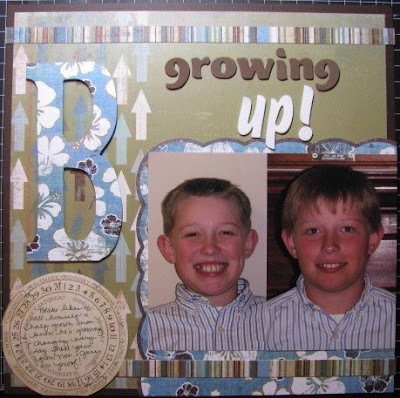 I wasn't lazy with this layout, I just really liked the look of the "naked" chipboard with these papers. Can you believe how much Blake changed from November to June??? I'm loving the new MME papers. 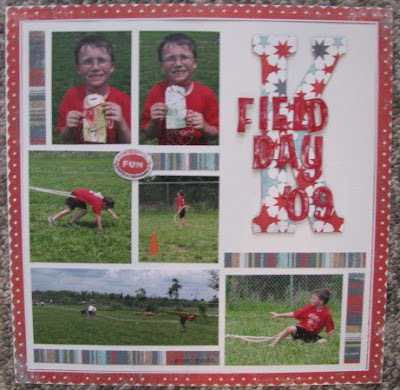 More MME...I loved this die cut paper, but didn't like the center of it with my photos, so I removed the center of the die cut, matted the border on cardstock and then used the pattern I removed to cover this large chipboard "K". 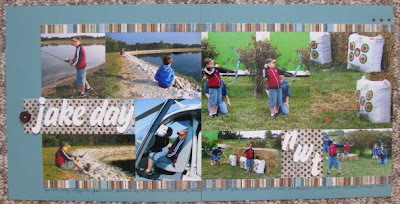 And more MME...These patterns were great for these outdoor shots at a Jake's event. So, there you have my favorite layouts from last month. 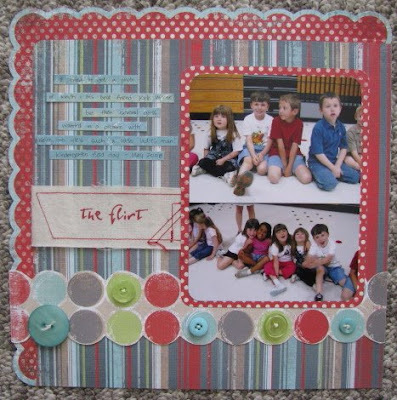 I hope to get back to scrapping more regularly when the boys are back in school. I know I have a lot of memories from this summer to scrap! great lay outs Amy. I wish I had the time to scrap like you, or made the time. I love the Published lO so great! Realy they all look great!